Catalyst was an improv troupe. 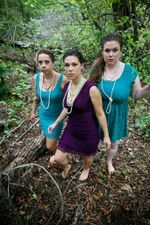 A new, all female troupe that's not afraid to go anywhere. A reality-based group, Catalyst seeks to approach real-life events with different perspectives, genuine emotions, and creative viewpoints. You'll laugh, you'll cry, you'll want to see them again! We get a suggestion from the audience, and start out in conversation and then jump into a scene. Our show is mainly characterized by three things: grounded subject matter, strong female performers, and monologues. During the scene we pop into monologues to give the audience "inside information" about the characters. We are not afraid of drama, but don't live there either. We approach things from real life and try to give honest depictions. Video of their 10/4/12 performance in The Threefer. This page was last modified on 10 June 2014, at 18:38.